A while ago I had signed up for the beta of Autodesk Fusion 360, Autodesk’s cloud based CAD solution, which was announced at Autodesk University 2012. The other day I got access to it as part of the Autodesk MyFeedback Program and have started playing around with it and submitting feedback to the Fusion 360 team. The agreement governing the Autodesk MyFeedback program dictates that you cannot discuss the products you are giving feedback on publicly, which makes sense because the products are still very much in development. So I’m not going to get into the details of Fusion 360 in this blog post. Autodesk has a beta of the Fusion 360 Community Hub where many beta users which include some Autodesk employees show off the models they have created (I’m assuming) using Fusion 360. 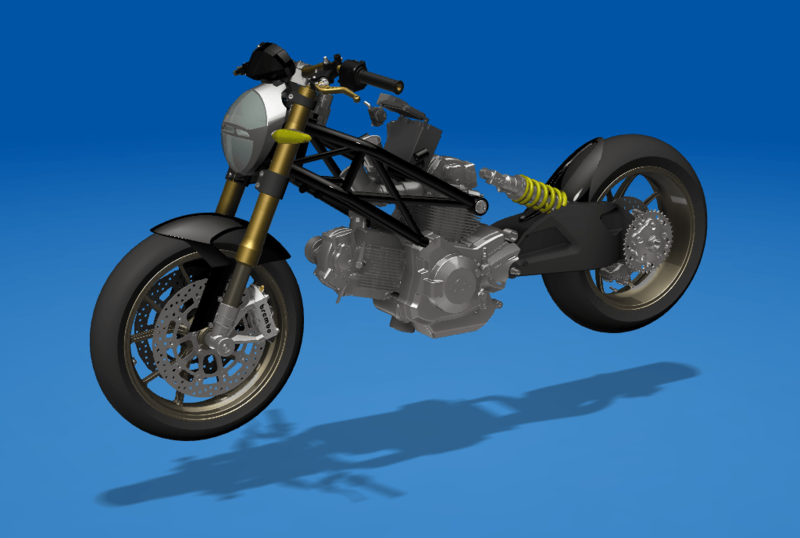 Here is an example of a Ducati motor cycle what an Autodesk employee and a good friend Kevin Schneider created using parts from GrabCAD. You can sign up for the beta by clicking on the sign up link on the community hub page. You will need to be on a 64-bit system running Windows 7, Windows 8, OSX Lion or OSX Mountain Lion to install Fusion 360. Yes, install. This is a “cloud based” CAD system, not a browser based CAD system like TinkerCAD or 3DTin. There is a part of it that needs to run locally on your computer. The Fusion 360 community hub also has a forum where you can start or join in a discussion on Fusion 360. This forum is actually part of the Autodesk Discussion groups. I’m not sure why the folks at Autodesk decided to create a Fusion 360 forum here. I can see people posting screenshots and videos of issues they are facing and Autodesk employees are ending up offering product support here. The correct place for doing this is the Autodesk MyFeedback portal which much more organized and prepared for such things. As a software developer myself I can’t stress enough on the value of beta testers. Some people think that of beta testing as working for free for the software developer and doing their job for them. They expect that as paying customers the software that gets shipped to them should be stable enough for production use. Well, that would, or rather should, have been the case if we didn’t have this concept of annual release cycles where software must be pushed out of the door one way or the other so as to support the subscription business model. But for a completely new product like Fusion 360 feedback from potential users is critical to ensure that the product is is good shape the day it ships for the first time.